(Newser) – What do you do when a city is sinking? Why, you move it, of course. That's what the Swedish city of Kiruna has decided because iron mining below it has weakened the foundations of houses and buildings, Tech Insider reports. Now LKAB, the state-owned company behind the mining, is dedicating billions of dollars to moving Kiruna about 2 miles east. 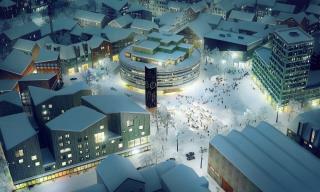 The ongoing 30-year plan includes relocating 21 particular buildings (like Kiruna's city hall and its attractive church) and paying residents to have their homes demolished and rebuilt at the new location, the Guardian reported last year. An Arctic city that's in darkness most of the year, Kiruna "will be a bit like a walking millipede with a thousand feet, moving, crawling, slowly ... toward the east," says an architect in a promotional video for the plan. There are several sci-fi books out there about mobile towns and cities in the far future. One I recently read was all about carnivorous mobile cities which fed on smaller towns and cities. Quite entertaining for an evening read. Good luck on the move. BUG OUT! They need to contact the Texas DOT and asked how they moved a whole mile of cement slab homes in south Fort Worth to make I-20. Well the most famous move is the city of Chicago to divert the flow of the canal from W-->E to E-->W so that the blood, guts ,and bits of the packing plant flowed away from Lake Michigan. All these blond hair, blue eyed Swedes aren't too bright.